Huntsville Ballet Company holds a long and rich history in the art of dance. Huntsville Ballet Company brings the finest quality of dance to the region, performing ballets such as The Nutcracker, Romeo and Juliet, The Firebird, Cinderella and The Sleeping Beauty. 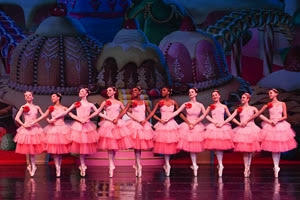 Each year The Nutcracker affords students from Huntsville Ballet School the opportunity to audition and perform with the Company at the Von Braun Center Concert Hall with the Huntsville Symphony Orchestra. Official School of Huntsville Ballet and premiere dance education in North Alabama. Huntsville Ballet School offers focused instruction with knowledgeable and proven instructors during our Summer Intensives. Classes for ballet levels 4 through 6 are held Monday through Friday culminating in a demonstration of the student’s work each Friday. Classes for ballet levels 2 through 3x are held Tuesday through Thursday culminating on Thursday afternoon for an in-studio demonstration showcasing the progressive work the dancers have done over the week. We can't pursue our mission without your help. Community Ballet Association is a 501 (c) (3) non-profit DBA Huntsville Ballet and was established in February 1963. Our goal is to maintain a highly skilled Company presenting the best in performance in North Alabama. If you would like to support our mission to share the art of ballet with the widest possible audience and enrich the artistic landscape of our vibrant community through education, performance and outreach, we humbly ask for your support. We work with local schools through our Education and Outreach programs to marry the art of dance with the curriculum and reinforce lessons through choreographed movement. Contact form: Please complete this form and a Huntsville Ballet staff member will contact you asap! Thank you for contacting Huntsville Ballet, A Pointe of Excellence! One of our staff members will be in touch with you soon.